You have finally decided that your family (you, the hubby, one teenager, twin seven-year-old kids and much-loved tabby cat – Tiddles), have outgrown your well-lived in family home. It’s served you well over the years but there’s no room to even swing a cat (not that we are condoning swinging Tiddles around by his tail – as if he would let you anyway)! It’s time to move onwards and upwards, and as you’re on the move anyway you decide a change of area would be nice too. You find a lovely pad in a new neighbourhood an hour away from your current place and set about making preparations for the big move. The hubby is happy (he’s nearer work), the teenager is happy (he’s nearer the skate park), and the kids are happy (they are nearer their grandparents), you are happy too – the new house is bigger, brighter and in a nicer spot, but what about Tiddles the cat? 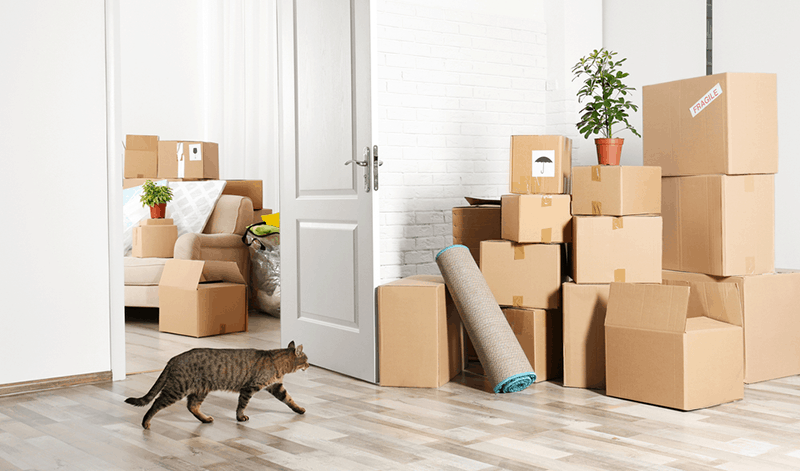 Moving home can be a stressful time for the whole family, it’s exciting but there’s a lot of upheaval and change, and not everyone handles the disruption well. Your cat will have a lot to deal and you will need to make the transition as smooth as possible for him. 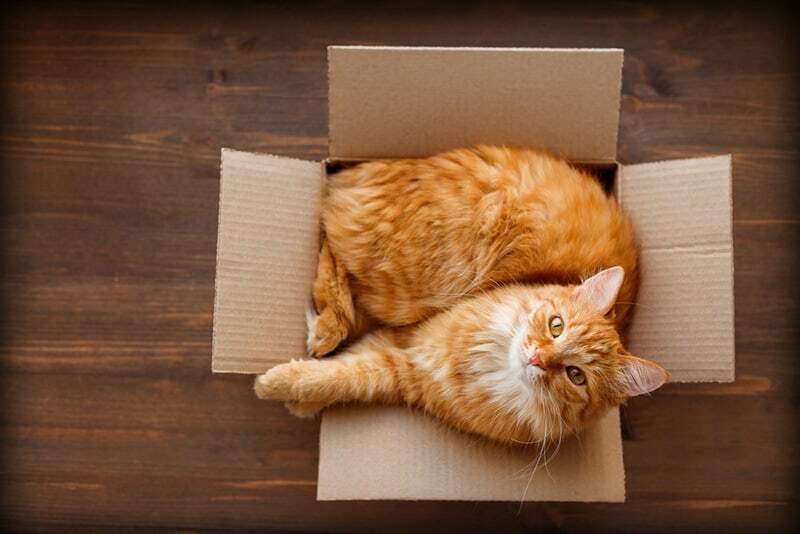 It’s a fact – cats love boxes, actually, they just don’t just love them, they positively adore them! When you start packing put a box on the floor, we guarantee if puss in in the vicinity he will hop right in. Even if the box is small, even smaller than a shoebox we would wager that kitty will squeeze his fluffy bulk right on in there! Cats are quite solitary creatures, when they want fuss they will come and let you know, otherwise they will seek solitude and security in the form of a cosy space (like a small cardboard box). Make sure you don’t accidentally pack Tiddles with the fine china though! Leave a “cat box” free (label it for extra security) and put it out of harm’s way (in a designated room that has windows and doors closed to prevent cat-astrophe)! This way your cat as a safe hiding place if it all gets too much and can’t escape out into the neighborhood in a panic. 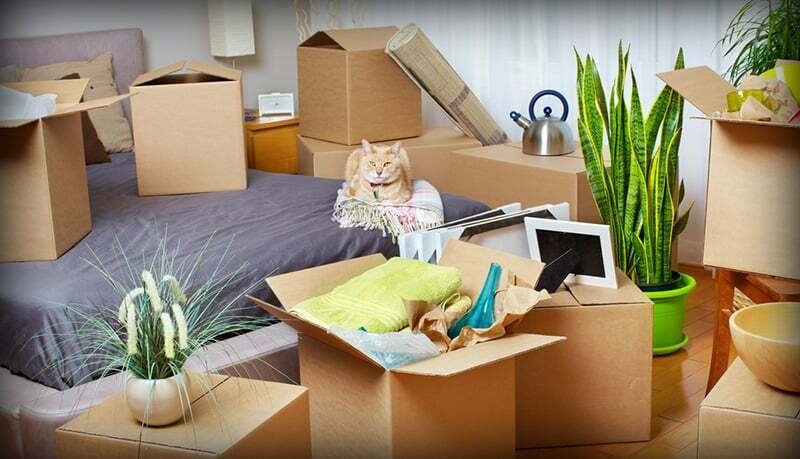 Moving day is finally here, now is not the time for letting your puss go for a wonder outside, there’s a lot to be spooked by – large vans and large men lugging furniture to name but two things. It’s also unwise to let Tiddles roam around your rapidly emptying home. He might be disconcerted by the unfamiliarity of it all and decide to hide (playing cat hide and seek is not conducive when you have a van full of furniture awaiting departure and the new family lingering impatiently for the keys so they can get in)! It’s best to designate a room for your cat and close the windows and doors so he cannot disappear, put a sign in the door informing everyone that Tiddles is inside so “please do not disturb,” until you are ready for the fun and games of loading him into his travel carrier. It’s a good idea to try and give Tiddles his breakfast early on moving day (motion sickness in a cat travel box is no fun for anyone). Leave water in the room where he is being confined and make sure his bed is in there for comfort (or an empty box – see below for more on that)! Think about what you might need for the journey and try and make Tiddles as comfy as possible once he’s popped into his carrier. There’s no place like home, but at first Tiddles might not agree with that, he might be disgruntled about having to leave his old stomping ground in favour of this new, strange place. Help your cat to see that he’s welcome by designating a room for him (again close windows and doors so he cannot flee). Start by putting the carrier in the room and talk to puss to let him know you are there. Put out his food and water bowls, his litter tray, toys and bed (you can add the empty box again if it helps), and then slowly open the door so he can take in his new surroundings. Again, a note on the door will remind you, your family and the removal team that Tiddles is inside. Once you are ready coax Tiddles out of the room, encouraging him to explore his new home. Start small and try and allow your cat into one room at a time if you can, just so the experience doesn’t become too overwhelming. Hopefully Tiddles will soon settle in and will be lounging on the new sofa, snoozing on the mat and purring away contentedly in no time.